A wood warbler was also reported last week near the sphagnum paddock which was a new species for the site so we are edging towards the big 100! Tree pipits have started to sing out on the heath and in the scrubby margins blackcaps, garden warblers, willow warblers and chiffchaffs can be heard. A peregrine falcon was also seen flying across the main heath at the beginning of the month. 5 ravens were seen flying over and the first cuckoo was heard at the end of April. Spotted flycatchers have also started to return with the first one being seen near the straight boardwalk on the 15th May. Other highlights this month include lots of toad and frog tadpoles in deocy pond, smooth newts and dragonfly larvae being found in the new pond next to the veteran oak, this pond was only created 18 months ago. Several butterflies have been recorded in the last few weeks, look out for the bright yellow brimstones flying across the heath or woodland or the distinctive orange tip butterfly, other species seen include commas, holly blue, green hairstreak, peacock and small tortoiseshell. 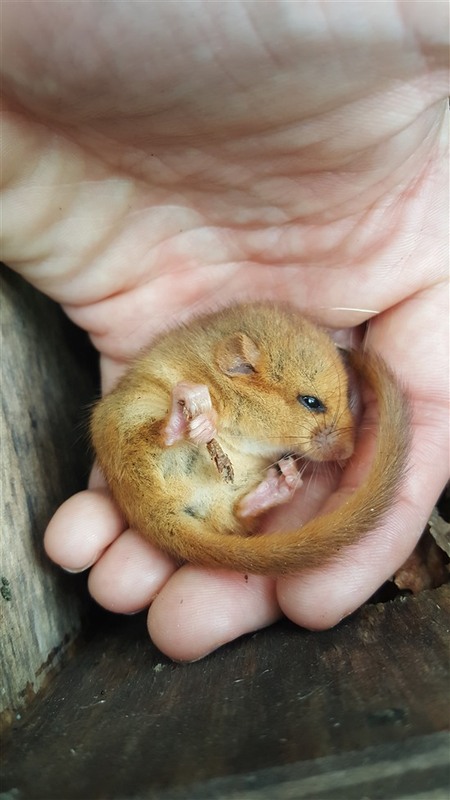 Our Sleepy Dormouse event was held on the 19th of May, it was a great success with everyone getting to see some as well as learning about their habitat and what work we do to enhance this at Broadwater Warren. The Exmoor ponies are now back on the reserve, this year 10 ponies will be on site to carry out conservation grazing out on the heath. They provide a natural structure to the Molinia grass and heather which provides ideal habitat for feeding and nesting of our ground nesting birds – Woodlark, tree pipit, nightjar and woodcock. Please be aware that these are wild ponies and such shouldn’t be fed as this can cause them to become ill.